Adelaide Furniture Removal & Recycling | 1-800-GOT-JUNK? In such a beautiful city, there's no shortage of things to see and do. From the days at the beach to the hustle and bustle of City Centre, life in South Australia always has something to offer. So why sacrifice time spent having fun in favour of junk? Instead of living with unwanted possessions, 1-800-GOT-JUNK? can do exactly what our name implies: get your junk. As Australia's biggest name in junk removal, we'll do the heavy lifting on your schedule, picking up and removing virtually anything. If your home or business is full of unwanted furniture, we're the only name you need to know. Goodbye junk. Hello relief. As your number one name in trusted junk removal since 1989, no one can handle junk like we can. For nearly 30 years, we've been impressing homeowners and businesses across greater Adelaide, providing unbeatable services for amazing rates. We know that it can be hard to get rid of unwanted items, especially when they are over-sized, heavy, or awkward to lift. Instead of trying to wrestle old armchairs or broken refrigerators to the curb, let our team take over. We'll make sure your clutter is no more, from the smallest loads to the biggest, heaviest items. Standard waste disposal services may be able to take away your trash, but what will they do with it? Instead of adding to junkyards or posing threats to the environment, choose the team that was recycling before it was cool. When you choose 1-800-GOT-JUNK?, you're choosing an ethical way to dispose of rubbish, giving you an eco-friendly way to make sure your old furniture isn't a problem ever again. We know just how precious our planet is. Instead of risking it all to make junk disposal easy, we go above and beyond to ensure every item we pick up is processed and recycling according to the strictest local and federal regulations. No matter what you need, 1-800-GOT-JUNK? has your back. We know that removing furniture can be a struggle, and we're here to take the weight off your shoulders. Dragging over-sized couches, heavy beds, or L-shaped desks to the curb or dumpster may be too much to handle, but that's why we're here. Our team knows furniture, deftly navigating even the biggest, heaviest pieces off of your property and out of your life. If two men can lift it and it fits in our trucks, we can take it. Just point and junk disappears! Worried about giving up time in your busy schedule to organise your rubbish and wait for a team to haul it away? Don't be. 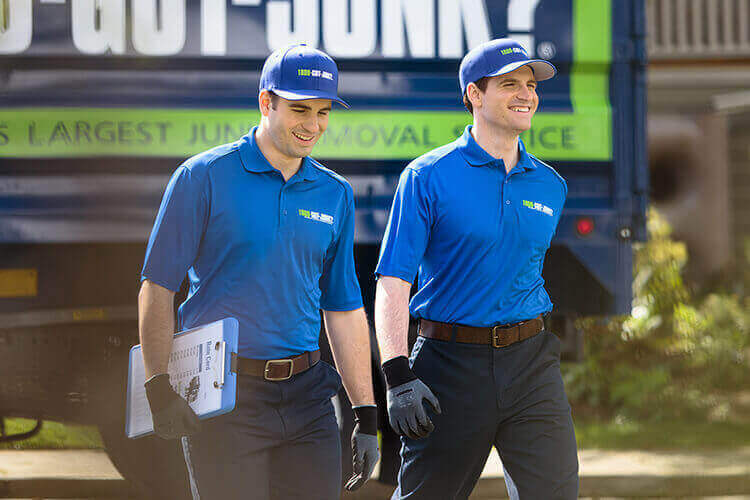 At 1-800-GOT-JUNK?, we know that you have more important events on your calendar than junk removal, so we'll work with you to find a time that's right for you. With availability on nights and weekends, we can show up when it's convenient and take junk from almost anywhere. That's right – just point us in the right direction and we'll do the rest! As members of your local community, we care about keeping Adelaide clean and junk-free as much as you do. That's why we're dedicated to removing anything you need from your home, business, or yard, taking it off your hands and recycling it responsibly. We live to serve the place you call home and we'll always do whatever we can to exceed expectations. We're in your neighbourhood, and we're happy to help. Are you ready to see what a junk-free life is really like? Good. Call or click today to schedule an appointment with 1-800-GOT-JUNK? and watch your unwanted furniture vanish before your eyes, one item at a time.